Hao GS series single-screw pump, also known as: stainless steel screw pump, eccentric screw pump, screw pump, concentrated pump, volumetric pumps, slurry pumps and so on is based on principles of positive displacement rotary gear together the work of a new pump types, the main working parts is the eccentric screw (rotor) and fixed bushing (stator). Since the components of the special geometry, namely, the sealing capacity of the formation of a separate chamber, the medium introduced by the uniform axial flow, internal flow rate is low, volume remained unchanged, pressure stability, and thus does not produce eddy current and stirring. The output of each pump pressure 0.3 ~ 0.6Mpa lift 20 ~ 60m (Shimizu), a high degree of self-absorption is generally more than 1 ~ 3m. Due to the stator to a variety of flexible material, so this pump for high viscosity fluid delivery and contain hard particles floating medium or medium containing fiber transmission, there are generally incapable of pumping kinds of features. Is proportional to its traffic and speed. Rotation generally use a direct drive coupling can be used to speed motors, or devices such as variable speed V-belt, and gearbox. This pump advantages: 1, flow, pressure stability, and no pulse. 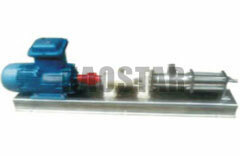 2, variable speed you can change the output flow can be used as metering dosing. 3, inhalation ability, work noise, no leakage, no temperature rise. Inhalation of good performance, pressure, flow and stability. Hao GS-type single-screw pump is a kind of eccentric rotation within the gear volume pumps, pump the main components: a single-head screw of the rotor and an elastic material is usually manufactured with a pun spiral stator, when the rotor is scheduled to type cavity around the stator axis for planet rotation, the switch formed between the sealed stator along the wrist on the resulting displacement of the rotor spiral; so will be a continuous medium, the average rate, the volume and the constant pressure from the suction sent out the end of Based on this characteristic, single-screw pump is particularly suitable for the work of the following conditions. Requires delivery of the pressure stability, and media do not like to destroy the existing structure, the selection of a single screw conveyor is ideal. 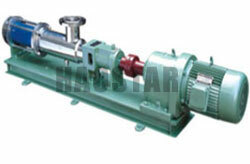 Single-screw pump has been widely used in foreign countries, most countries that single-screw pump for the "MONOPUMPS Mono pump", the German also known as "eccentric rotor pump. "Because of its excellent performance in recent years, the scope of application in China is also expanding rapidly. 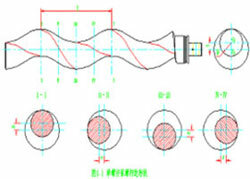 It works with special spiral surface by the flexibility of the stator cavity with a large lead with the big teeth of the rotor relative to the high teeth together, in the stator cavity form a continuous sealing line will suction out the cavity with the pressure chamber separated from the rotor rotation cavity to the discharge direction of continuous movement, so that materials continued to be pumped and discharged. The greatest feature is an adaptable medium, flow smoothly, pressure pulsation is small, self-absorption capacity of the high, it is any other kinds of pumps can not be substituted. Our domestic production of single-screw pump products, made a comprehensive research, to win public long, for their continuous product innovation. Currently our factory's products have already become system, pressure 0.3 ~ 0.6MPa, also according to customers on a single screw pump tailored to the different special needs. And centrifugal pumps compared with single-screw pump do not need to install the valve, while the linear flow of traffic is stable. And the piston compared to a single self-priming screw pump has a better ability to suction the water column height of up to 8.5 meters. And diaphragm compared to single-screw pump can transport all kinds of mixed impurity containing gas and solid particles or fibers of the media, but also transport all kinds of corrosive substances. 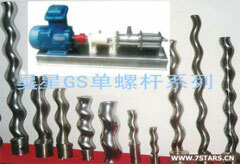 And gear pumps compared to single-screw pump can transfer high-viscosity substances. With the piston pump, diaphragm and gear pumps is different is that single-screw pump can be used for pharmaceutical filling and measurement.